A Welcome Reception Cocktail is planned for Sunday June 25 from 8:00pm to 9:30pm in the hotel Botánico. This will be an opportunity for the attendees to meet and greet in an informal setting. Appetizers and drinks will be served. The Registration Desk will be open for those willing to register before Monday morning. The Cocktail is included in the registration fee but we kindly ask the participants to notify their intention of coming or not, or if they will come accompanied, when registering, in order to avoid food wastage. ALPAO has organized a Social Event for the evening of Tuesday 27th. 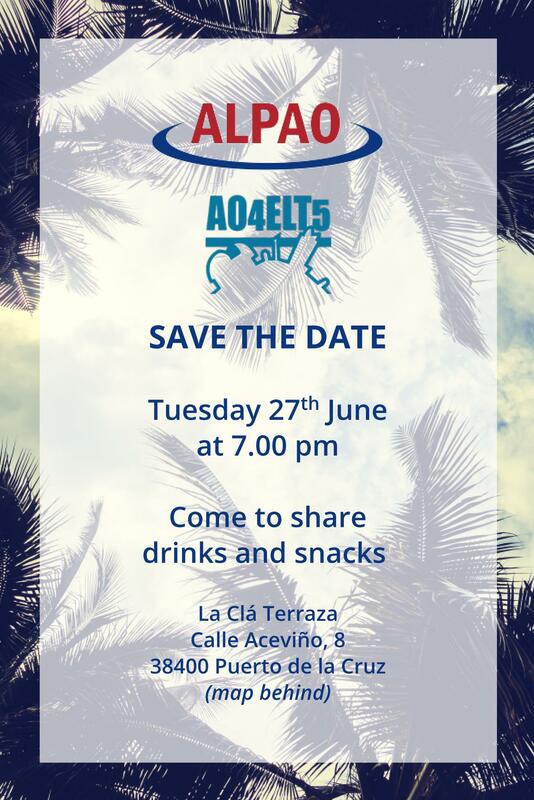 They invite the AO4ELT5 participants to join them and share a drink at La Clá, at a short walking distance from Hotel Botánico. A visit to the Observatorio del Teide, included in the registration fee, will take place on the afternoon of Wednesday 28th 2017. We will depart with buses from the Conference Venue after lunch. All the participants are invited to come but should please confirm before, when registering or at the Conference Registration Desk upon arrival. Extra tickets are available for a price of Euro 10, but should be booked in advance, either when filling the Registration Form or upon arrival at the Registration Desk. A conference dinner, included in the registration fee, will be held on Thursday 29th 2017. The venue is "La Gañanía", a restaurant situated in a beautifully renovated ancient canarian house, where a menu of creative cuisine with canarian roots will be served. Extra conference dinner tickets are available for a price of Euro 60, but should be booked in advance, either when filling the Registration Form or upon arrival at the Registration Desk. We will depart with buses from the Conference Venue, and return to Hotel Botánico after dinner. On Saturday 1 July 2017 there will be an organised visit to the Roque de los Muchachos Observatory on La Palma. The visit will be scientifically supported by the IAC. The tour is organised by the AO4ELT5 Secretariat, Magna Congresos. The flight to La Palma will departure in the morning and return to Tenerife in the evening. The minimum number of participants to organize the tour is 15. To book this tour please follow this link. You will need to provide your passport details. Using the link you can book your seat on this tour, as well as the seat of a companion. You will be expected to provide your credit card details to confirm your reservation. Your card will not be charged until the minimum number of participants is reached.